Mark Hedden, 83, of Vienna, a well-known archaeologist in Maine, was safe Tuesday evening after he became lost in the woods. 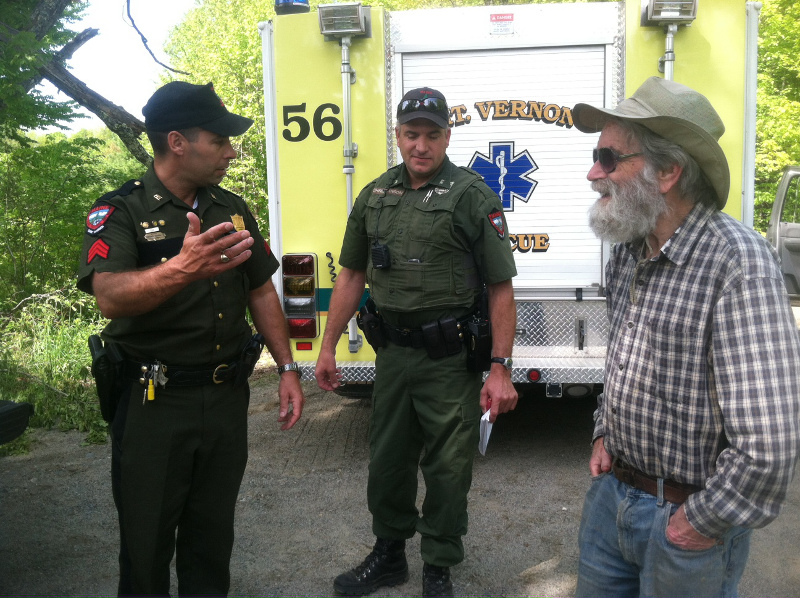 VIENNA — An 83-year-old man who’s a well-known archaeologist in Maine was safe Tuesday evening after he became lost in the woods, resulting in the formation of a search party by police and game wardens. Mark Hedden wandered the woods behind his house off Anderson Road for about three hours before finding his way home, said Game Warden Dan Christianson. He said Hedden was in good health, in spite of the ordeal. “He was pretty tired,” Christianson said. Hedden and his wife, Carol, were walking their property, which includes 118 acres, when they decided to split up around 11:20 a.m. Hedden planned to walk toward a spring on the property, Christianson said. Carol Hedden went in search of her husband when he failed to return. She called for help around 1:20 p.m., two hours after they separated. “She looked for him quite a while before she called,” Christianson said. Hedden told authorities he somehow got turned around, but knew he was still somewhere on his property. “He knew where not to go,” Christianson said. Carol Hedden said there had been a lot of selective tree cutting on their property recently, which she thinks resulted in her husband missing a certain path and becoming lost. “I think he just got disoriented,” she said. She said her husband is a well-known archaeologist who’s deeply involved in prehistoric archaeology, with a specialty in petroglyphs, or rock engravings. He has worked as an archaeologist for several decades, including contracting work for the state of Maine and then as a state archaeologist. Tuesday afternoon, firefighters from several surrounding communities were called to the road with four-wheelers and other all-terrain vehicles to help with the search for Mark Hedden. A warden service dog had picked up Hedden’s scent and was tracking him when he found his way home. A warden plane was also on its way to help, Christianson said. Hedden eventually found a road he recognized and was able to make his way back home. Carol Hedden said she was relieved by the outcome and the search effort.